Manuela Wuelling is at the Centre for Medical Biotechnology, Department of Developmental Biology, University Duisburg-Essen, 45141 Essen, Germany. Andrea Vortkamp is at the Centre for Medical Biotechnology, Department of Developmental Biology, University Duisburg-Essen, 45141 Essen, Germany. The growth of long bones in young mammals (including children) is driven by the growth plate, a zone of cartilage that separates each end of the bone from the main shaft. The growth plate contains three distinct types of cartilage cell (chondrocyte). Round chondrocytes in the resting zone of the growth plate differentiate into flat, proliferating chondrocytes that form columns along the bone’s longitudinal axis. These cells later become hypertrophic chondrocytes that cease to proliferate and are replaced by bone and bone marrow. Consequently, growth-plate chondrocytes need to be replenished continuously and the stem cells that fuel this process have long been sought. Writing in Nature, Newton et al.1 and, previously, Mizuhashi et al.2 have identified a type of skeletal stem cell in the resting zone of mouse bones that gives rise to all types of growth-plate chondrocyte, as well as some of the long-lived stem cells of the bone-marrow stroma (non-blood-lineage cells). Both groups tracked the descendants of individual chondrocytes by genetically modifying the cells to express various fluorescent proteins. The authors identified slowly dividing cells in the resting zone that give rise to monoclonal (originating from a single cell) columns of proliferating and hypertrophic chondrocytes that span the entire growth plate (Fig. 1). Figure 1 | How long bones grow. The postnatal growth plate of a bone, which is made of cartilage, is located between the end of the bone and its shaft (cartilage shown in blue, ossified tissue in brown). The growth plate can be divided into a resting zone that contains round cartilage cells (chondrocytes); a zone that is formed by columns of flat, proliferating chondrocytes; and a zone comprising large (hypertrophic), non-proliferating chondrocytes. Newton et al.1 show that the resting zone contains stem cells (red) that form monoclonal (originating from a single cell) columns of flat and hypertrophic chondrocytes, some of which become bone-forming cells (osteoblasts) or stem cells of the bone-marrow stroma (which are not from the blood-cell lineage). One resting-zone stem cell and the descendants of that single cell have a dashed outline. The mammalian target of rapamycin complex 1 (mTORC1) signalling pathway maintains the self-renewal potential of resting-zone stem cells. Parathyroid hormone-related protein (PTHrP), produced in the resting zone, and the protein Indian hedgehog (Ihh), produced by early-differentiated hypertrophic chondrocytes (cross-hatched cells), interact to regulate the proliferation and differentiation of growth-plate chondrocytes, including resting-zone stem cells. The newly identified cells expressed stem-cell markers and had the potential to differentiate into multiple cell types. Furthermore, when labelled in juvenile mice, the cells continued to generate columns of chondrocytes into adulthood. Newton et al. also investigated how the cells divide, and found that they are maintained as dormant cells, but occasionally undergo an asymmetric cell division that produces one self-renewing cell and another cell that is prone to differentiation. Together, these observations demonstrate the stem-cell character of the newly identified cells and support the hypothesis that rare, asymmetric stem-cell divisions refill the chondrocyte pool of the growth plate, which is expanded further by the transient proliferation of the stem cells’ daughter cells (flat chondrocytes). How diverse are the stem cells identified in the two studies? Newton et al. labelled chondrocytes that express type II collagen. Such cells are likely to include the population of cells expressing parathyroid hormone-related protein (PTHrP) that were tracked by Mizuhashi and colleagues. Notably, although resting-zone stem cells clearly belong to the chondrocyte lineage, Mizuhashi and colleagues found that they express a comparable set of stem-cell markers and undergo a maturation process similar to that of bone-marrow stem cells. The mechanisms that regulate the sequence of differentiation of both stem-cell types are, however, still to be deciphered. Where do the resting-zone stem cells come from? 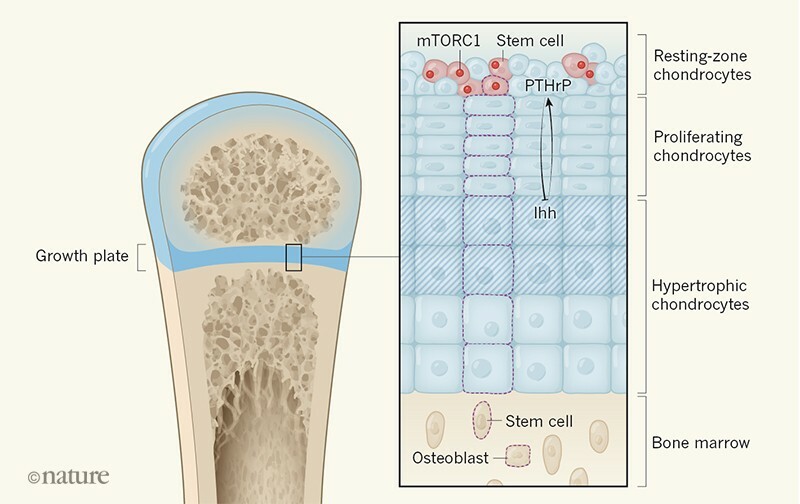 Embryonic bone growth, like postnatal bone growth, is driven by the proliferation of chondrocytes, followed by hypertrophic differentiation and the replacement of chondrocytes by bone. The process results in an ossified bone shaft that is flanked by cartilage at both ends. Newton et al. labelled embryonic chondrocytes and found that some develop into resting-zone stem cells. These experiments also revealed that, before birth, individual columns of proliferating and hypertrophic chondrocytes have a multiclonal origin, rather than being derived from a single, self-renewing stem cell. This observation implies that embryonic and postnatal bone growth is organized in surprisingly different ways. How do cells derived from embryonic chondrocytes acquire a stem-cell character? Both studies show that the manifestation of self-renewing potential is linked to the generation of secondary ossification centres (areas where bone tissue forms) at the ends of bones soon after birth. Newton et al. investigated the mammalian target of rapamycin complex 1 (mTORC1) pathway, which has been reported to regulate stem-cell function3. They found that chondrocyte-specific activation of mTORC1 signalling leads to a shift from asymmetric to symmetric stem-cell divisions, and consequently to an increased number of stem cells in the resting zone. These observations strongly support a role for mTORC1 in regulating the self-renewal potential of resting-zone stem cells. Both groups also analysed the role of the protein Indian hedgehog (Ihh), a member of the Hedgehog family of growth factors that is expressed in early-differentiated hypertrophic chondrocytes. Ihh has been shown to induce the expression of PTHrP in resting-zone chondrocytes, which in turn inhibits the premature initiation of hypertrophy in proliferating cells4. Additionally, both Ihh and PTHrP activate chondrocyte proliferation3. Newton et al. and Mizuhashi et al. provide evidence that the inhibition of Hedgehog signalling reduces the length of chondrocyte columns. Newton and colleagues also observed increased proliferation and the expression of genes targeted by Hedgehog proteins in resting-zone cells after activation of the Hedgehog pathway. These findings suggest that Hedgehog signalling has a role in controlling the stem-cell character of resting-zone cells. However, given that Ihh regulates PTHrP expression directly, the observed changes in chondrocyte-column length and cell proliferation might also be a consequence of altered PTHrP levels. Furthermore, when Newton et al. inhibited Hedgehog signalling and activated the mTORC1 pathway simultaneously, some stem cells moved from the resting zone into the proliferating zone without differentiating into flat cells. Together, these observations support a role for Ihh in regulating stem-cell proliferation rather than stem-cell identity. Given that the interaction between Ihh and PTHrP signalling is complex, it will be challenging to distinguish clearly between the roles of Ihh as a regulator of stem-cell proliferation, PTHrP expression and the induction and maintenance of ‘stemness’. The model of how cartilage is replaced by bone has changed substantially in the past few years. Previously, hypertrophic chondrocytes were thought to die and then be replaced by bone-forming cells called osteoblasts. However, more recent fate-mapping studies have shown that a fraction of hypertrophic chondrocytes differentiate into bone-forming osteoblasts or long-lived stem cells and progenitor cells of the bone-marrow stroma5–7. Mizuhashi et al. now demonstrate that cells that are descendants of resting-zone stem cells contribute to the bone-marrow stroma. Therefore, such stem cells seem to follow an unusual path of differentiation, transforming from stem cells of the chondrocyte lineage into differentiated chondrocytes, and then into multilineage stem cells of the bone-marrow stroma. Future investigations should clarify how many of the postnatal bone-marrow stem cells descend from resting-zone stem cells, and whether these postnatal cells differ functionally from other bone-marrow cells. Given that bone-marrow-derived skeletal stem cells are required for bone turnover and fracture repair throughout a person’s life, deciphering the specific features of the chondrocyte-derived population will be of high clinical relevance. The identification of a growth-plate-specific skeletal stem cell is an important step towards understanding human skeletal growth and associated diseases, but many questions remain. 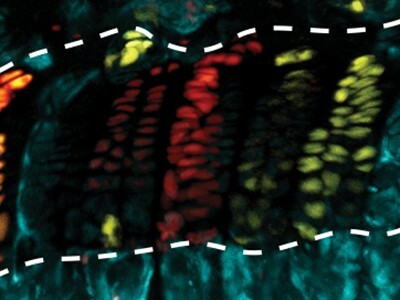 Follow-up studies need to determine which mechanisms besides Hedgehog and mTORC1 signalling induce and maintain the stem-cell character of these cells, which type of embryonic chondrocyte evolves into a resting-zone stem cell, and how the induction of that process is linked to the formation of secondary ossification centres. Further studies also need to clarify how the differentiation of stem cells in the resting zone is regulated, and which components of the chondrocyte-specific extracellular matrix (the network of proteins and sugar molecules that surrounds cells) are required to generate a stem-cell niche. Finally, given that some hypertrophic chondrocytes differentiate into osteoblasts and bone-marrow stem cells, whereas others die5–7, it is tempting to ask whether the fate of hypertrophic cells is already determined by the distinct subtypes of resting-zone stem cell from which they originate. Newton, P. T. et al. Nature 567, 234–238 (2019). Mizuhashi, K. et al. Nature 563, 254–258 (2018). Ito, K. & Suda, T. Nature Rev. Mol. Cell Biol. 15, 243–256 (2014). Ohba, S. J. Dev. Biol. 4, E20 (2016). Park, J. et al. Biol. Open 4, 608–621 (2015). Yang, L., Tsang, K. Y., Tang, H. C., Chan, D. & Cheah, K. S. Proc. Natl Acad. Sci. USA 111, 12097–12102 (2014). Zhou, X. et al. PLoS Genet. 10, e1004820 (2014).